HUGHES, Charles James, Jr., a Senator from Colorado; born in Kingston, Caldwell County, Mo., February 16, 1853; attended the common schools; graduated from Richmond (Mo.) College in 1871 and from the law department of the University of Missouri at Columbia in 1873; admitted to the bar in 1877 and commenced practice at Richmond, Mo. 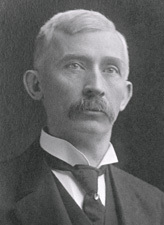 ; moved to Denver, Colo., in 1879; presidential elector on the Democratic ticket in 1900; professor of mining law in the law school of the University of Denver, Colorado, and Harvard University; elected as a Democrat to the United States Senate and served from March 4, 1909, until his death in Denver, Colo., January 11, 1911; interment in Fairmont Cemetery. U.S. Congress. Memorial Addresses. 61st Cong., 3rd sess., 1910-1911. Washington, D.C.: Government Printing Office, 1911.